A lot of people know how to transfer contacts from SIM card to iPhone. Of course it is very simple to copy the contacts from SIM card to iPhone when you are going to use a new iPhone. But most people don’t know how to do the opposite thing. In the past, mobile phone users thought they couldn’t lose their phones’ contacts or other data by backing up them to the phone’s SIM card. But now on the iPhone, there is not an easy way to do this. Have you ever thought about how to transfer contacts from iPhone to SIM? The truth is that iPhone does not support direct transfer of contacts from iPhone to the SIM card, because iOS is a closed operating system, which means data output is not allowed. iPhone doesn’t store any data on its SIM card because it doesn’t need to do so, and also because it doesn’t fit with Apple’s data security protection about how users interact with their data. However, this doesn’t mean any impossibility to transfer iPhone contacts to SIM. Actually, it is possible to transfer contacts from iPhone to SIM card with the help of some tools. There are several possible ways on how to save contacts to SIM on iPhone. Now, we will show you the detailed steps of a way to save contacts to SIM card from iPhone. Run Contacts app on your iPhone home screen and tap the sign of plus in the right upper corner to add a new contact. 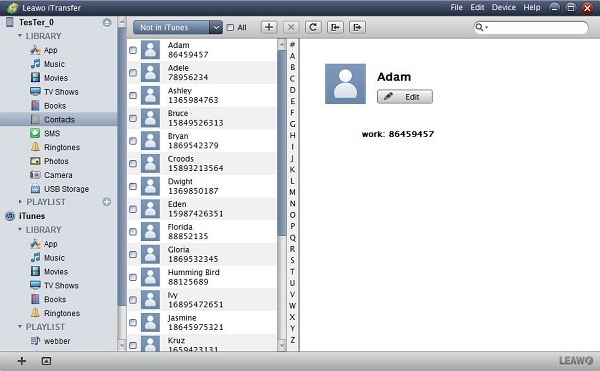 Then enter the basic information of your new contact such as name, company and phone number. Finally, tap on the button “Done” to save your contact. When your contact list is growing day by day, it seems to be difficult if you want to find someone’s contact number. You can go into your Contacts app and type the name you want to contact in the search bar which locates on the top of your contact app screen. Sometimes, you have forgotten the entire contact name, but you just need to enter the initial letter of the name and then the related contact name can be quickly browsed in the contact list. You should save the data in your contact list by selecting one of the above mentioned compatible file formats, which can be found in the drop down menu when you choose the option “save as type”. But in general, VCF format is current mainstream format to save contacts information. This can be a good way if you only need to transfer a few number of iPhone contacts to SIM card. You can do this by sending emails of the contacts. You can email the contacts one by one to your Android smart phone, and then import them to the SIM card in the Android phones. The detailed steps may better help you. Step 1. Go to the Contacts app on your iPhone, find those contacts you would like to transfer to SIM card. Then tap "Share Contact" and share these contacts via email. Step 2. Download the vCards you just shared via email on your Android phone. 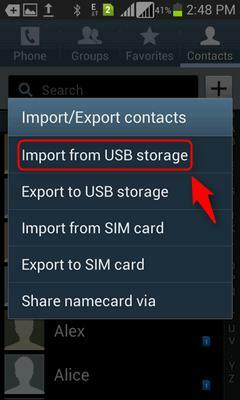 Go to Contacts app on Android phone, then you can choose "Import from USB storage". Step 3. Go to Contacts app to check if contacts have already been imported to your Android phone. 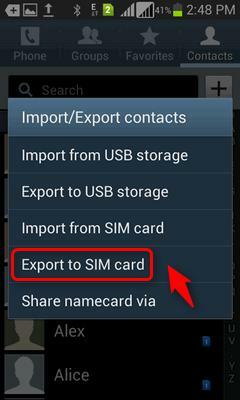 Then go back to "Import/Export contacts" again, this time you should tap "Export to SIM card". Of course you need to put the SIM card into the Android phone before this step. With this way, you can copy a limited number of contacts from iPhone to SIM card. This isn’t a direct and simple way to transfer iPhone contacts to SIM card. You need the extra help of an Android phone, and you also need to type emails one by one to import SIM contacts. Although, it is a good way to back up the contacts by coping them to SIM card, you can also use other backup methods to save the contacts, like use data backup programs or back up them to the cloud. 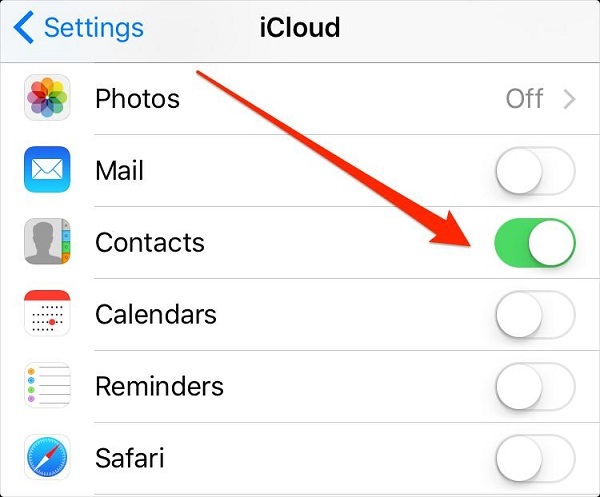 1.Enter the “Settings” and go into “iClouds” to find the “Contacts”. Toggle the button to the right and make contacts sync enabled. 2. Then the contacts in your iPhone will be synced to the iCloud. 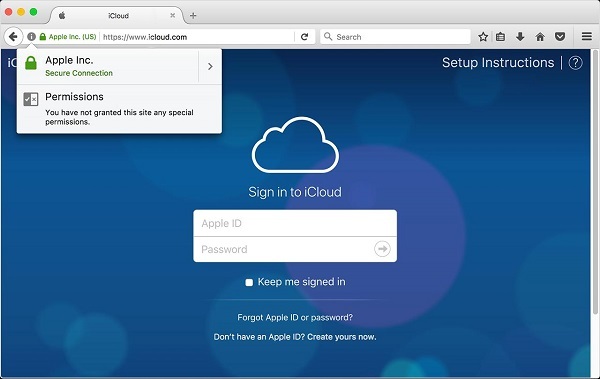 Get access to iCloud.com on web page via your computer, enter “Contacts” by logging in iCloud account. 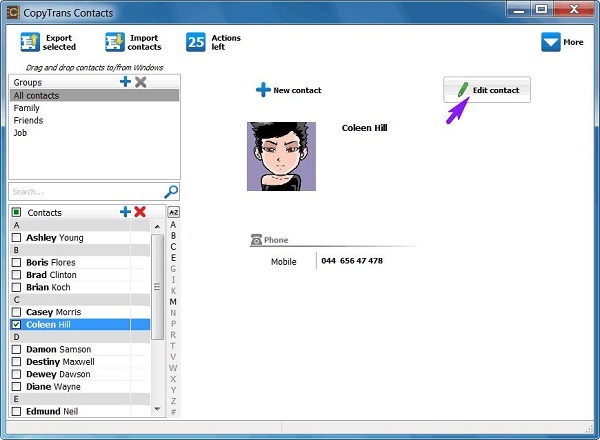 3.Hold the key option “Ctrl” or “Command” to choose the contacts. Next, the contacts will be downloaded to the computer by pressing “Export vCard”. 4.Finally, connect your Android device to computer and begin to transfer the contacts. Go into Contact App on Android phone, choose the option “import from USB storage” and make it export to SIM card as the picture shown below. 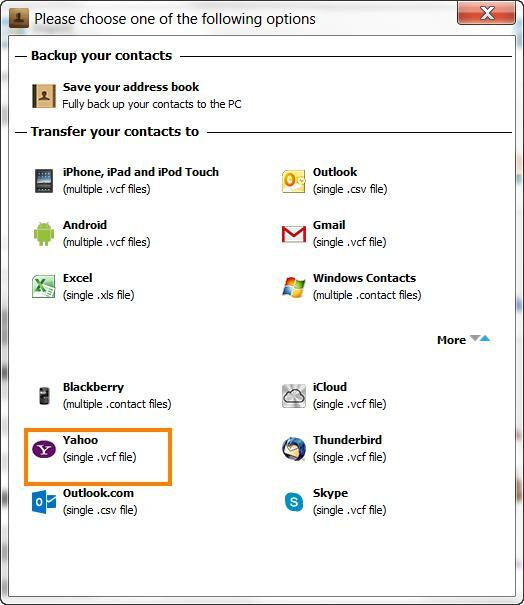 1.First, you need to export the contacts from iPhone to Yahoo. The program “Download CopyTrans Contacts” must be installed to help you finish this task. Choose the contacts you need to export when you launch the program, don’t forget your iPhone must be connected to computer at the same time. 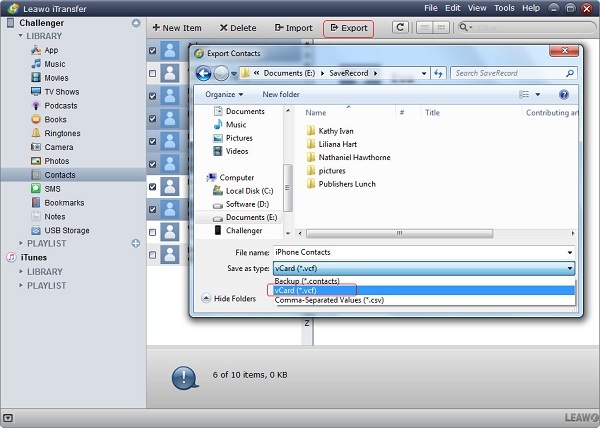 2.Then, press the button “Export selected” and choose the target folder on your computer to save it as vCard file format. A prompt will pop up and select the option “Yahoo”. 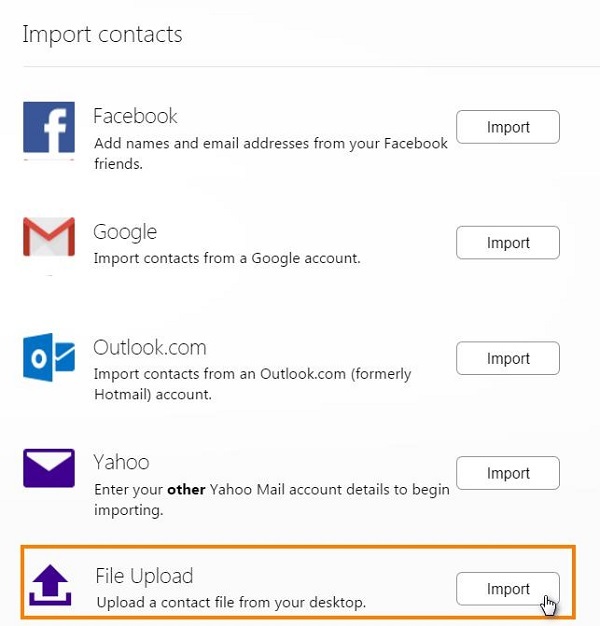 3.Next, enter your contacts in Yahoo by logging in Yahoo account, click “Import Contacts”. 4.Choose the option “File upload” by tapping on the button “Import”. 1. Go to mail menu in Yahoo and choose “Mail Options” in “Options”. 2. Click the category button “Contact or Address” and choose the option “Import/Export” in “Management”. 3. Choose “Yahoo!CSV” by clicking the button “Export”. 4. Click the button “Save” and select a location to save “Yahoo!CSV” on your computer. Finally, connect your Android phone to computer and enter Contact App, choose “import from USB storage” and “export to SIM card” as the method mentioned above. Above is all about how to transfer contacts from iPhone to SIM via Email. Now, let’s discuss another way of transferring contacts from iPhone to SIM. To transfer contacts from iPhone to SIM, you need the help of Leawo iTransfer . This program not only enables you to transfer contacts from iPhone to SIM, but also allows you to transfer many other data from iPhone to computer. 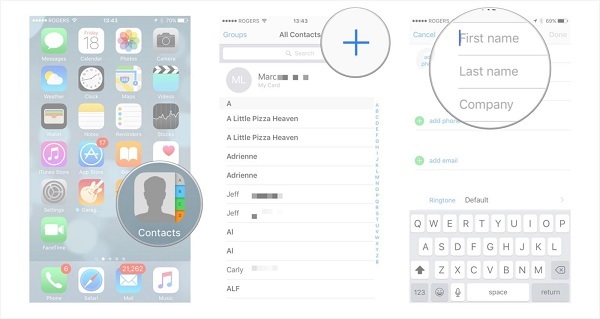 With Leawo iTransfer, you can backup iPhone contacts with only a few clicks, merge duplicated contacts, create contacts group and delete contacts on iPhone. Below are detailed steps of transferring contacts from iPhone to SIM. Download and install this iTransfer on your computer. . Launch Leawo iTransfer and connect iPhone to computer. The software will recognize your iPhone and automatically detect and list the contents in the left sidebar. Go to "Contacts", and all contents will display in the right part. 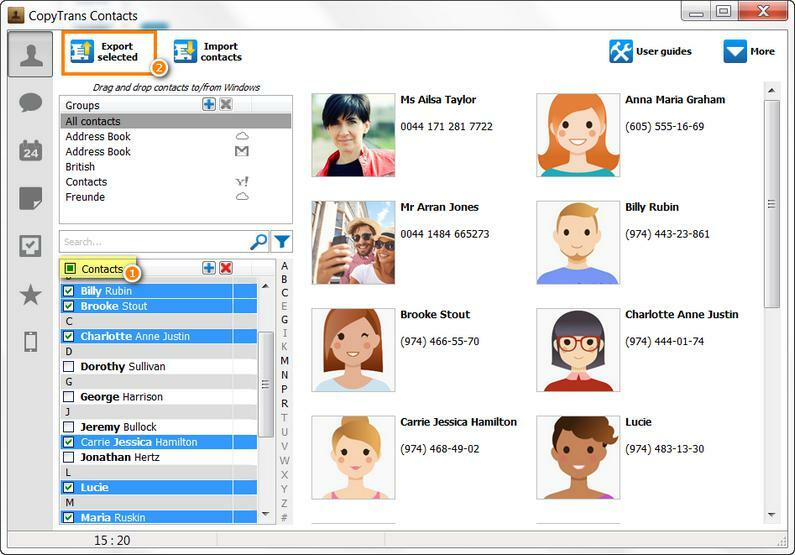 Select the contacts that you would like to save to the SIM. Click the Export button at the top middle. You can hold Ctrl or Shift key to select certain contacts. Choose a target folder on your computer to save the contacts when a pop-up dialog shows up. 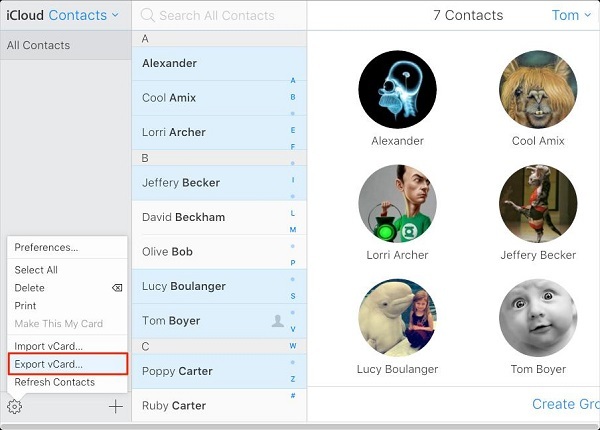 Save the contacts as vCards so that you can manage them easily. Then click "Save" button to start transferring iPhone contacts to computer. When the transfer finishes, you’ll get the contacts in the target folder saved as vCards. 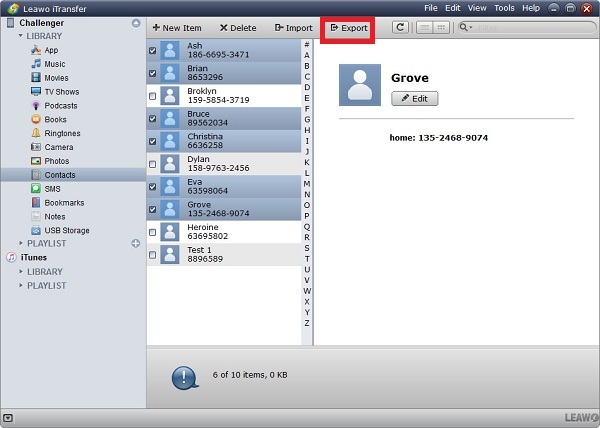 You are able to open the file on your computer easily, and you can manage the contacts. Email the vCards to your email on computer, and then sign in your email account on your Android phone. Just follow the Step 2 and Step 3 of Part 1, you are able to save the contacts to SIM. With the help of Leawo iTransfer, you can transfer a lot of contacts from iPhone to SIM card easily, and you will have a clear view of the transfer process, which wouldn’t miss any important contact information during the process. Leawo iTransfer helps you save the time as well as saving the data.